The railway line was Kenya's biggest infrastructure project since independence from the UK in 1963. 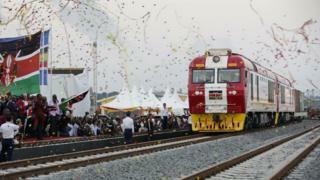 President Uhuru Kenyatta opened it in May last year, hailing it as a new chapter in the East African state's history. 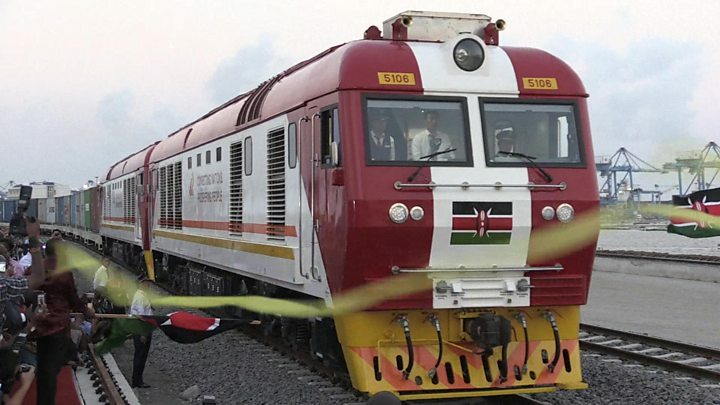 The project was also condemned by wildlife groups as the line runs through the Nairobi National Park and Tsavo National Park in south-eastern Kenya. Many Kenyans have welcomed the detention of Mr Maina and Mr Swazuri who were seen as "untouchables" because of the political influence they wielded. Mr Swazuri, in particular, appeared impervious to justice. When he was confronted last month on separate allegations of corruption around the payment of $30m in compensation to private individuals, he dismissed the allegations and was quoted telling reporters: "I am here. I am not leaving. You can't do anything to me." But Mr Swazuri and Mr Maina spent the weekend in police cells. The arrests came after President Kenyatta renewed his promise to tackle corruption, and appointed a top intelligence official, Noordin Haji, as the new chief prosecutor in March. His team has not been scared to knock on the doors of powerful and wealthy individuals, but the question Kenyans are asking is: Will there be any convictions? Mr Maina and Mr Swazuri were handcuffed after they took their seats in the dock at a magistrates' court in Nairobi. The directors of several companies are among the 17 accused. They all denied the charges. The arrests are the latest sign of the government intensifying its campaign to end the culture of impunity in Kenya. Speaking during a church service on Sunday, Mr Kenyatta said: "Over the last few weeks I have lost so many friends. "I have received many calls, being asked: 'How can you sit and just watch all this destruction going on. You must stop it.' But I said, it is difficult to stop, not because we love to destroy but because we must fight impunity."